Some of LA's finest singers and musicians pay tribute to their fallen colleague Dafni, a delightful and diminutive lady whose songwriting shines in this 31-song collection. 1. Are You Ready for Fun? When your wife is a songwriter it can difficult to know for sure if the music she comes up with is as good as you think it is. I always enjoyed Dafni’s songs, which I found catchy and fun and interesting (she always had a strong sense of melody and was very solid rhythmically), and I loved seeing her play them live, but perhaps I was biased in my feelings for the songs by my love for her as my wife. Were these songs of hers really any good? In July 2016, over 50 of Dafni’s friends performed at a memorial tribute show in her honor at the Cinema Bar in Culver City. She had passed away just two months earlier, and, looking back, it was remarkable how such a successful event was pulled off during an emotionally trying time. About half the acts chose to cover a Dafni song, and it was a heartbreaking yet heartwarming experience to hear her melodies and words again, now taking on whole new dimensions of meaning. But, hearing her talented friends play them, I realized at that show that she did indeed have many good, and some great, songs. I have put this album together as a record of that event. I am indebted to all who contributed their time, skills, and talents to produce this wonderful double album, the proceeds of which will be going to the Dafni Amirsakis Memorial Fellowship Award set up in Dafni’s honor at UCLA. I met Dafni in April 1999 when I visited Los Angeles for a day to see some friends who were studying chemistry at UCLA. Dafni was a year or so into her PhD in Professor Fraser Stoddart’s group, and I had worked for Fraser a few years earlier in the UK. I took advantage of some free time during a seminar to check my email in one of the labs. The first person to arrive back was Dafni. We hit it off immediately. It was so easy. She was exceedingly friendly and personable and humorous and sweet, and I was flattered that she knew who I was from my previous stint in the group. The next day we went to lunch together within a larger group of our mutual friends, and that was the extent of my first interactions with Dafni. That night, as I flew to Australia, I thought to myself that Dafni was the kind of girl I’d like to have as a girlfriend. About a year later I was back in LA, working again as a postdoc for a couple of years in the Stoddart group. Dafni was still the same lovely young lady. We quickly became friends, and would go out for drinks in Westwood several evenings each week. In addition to being a grad student, Dafni was a budding songwriter and I went a few times to see her perform at the Crooked Bar on the Sunset Strip. She was a little girl with a big acoustic guitar and a strong voice, with a great sense of melody and some lovely songs. She was fun to watch. After three months we were a couple, and remained inseparable, the same fast friends, for the next 16 years. We got married in 2003. On May 19, 2016, Dafni passed out at the gym during a spinning class. Her heart just stopped, a sudden cardiac arrest. By the time the paramedics got her heart beating again, it was too late. She had been deprived of oxygen to the brain for too long, and although she received the best care possible—from her trainers and classmates at the gym, from the paramedics, and from the nurses and doctors at the ICU at UCLA—she was pronounced brain dead five days later. She had died painlessly, in good hands, doing a thing she loved so much, surrounded by friends. The outpouring of support and emotion was tremendous. Hundreds of Dafni’s peers, colleagues, and friends came to visit her in the hospital, and even more attended her funeral. Dafni was someone who found it very easy to make friends at work, at the gym, and in the music community in Los Angeles. She was that kind of person. An honest, caring, cheerful, Midwestern girl without a mean bone in her body. The kind of person you couldn’t help but like straight away. As I could attest. In the years after we met, Dafni continued to blossom as a songwriter, musician, singer, and performer. She was already competent as a fingerpicker, but continued taking guitar lessons for several years to master the jazz chords from the songs of Billie Holiday, Ella Fitzgerald, and Anita O’Day that she loved so much. She was extremely good at learning things, and combined tenacity with a strong work ethic. In 2001 her friend Jay Goin recorded four of her numbers, just vocals and guitar, for an EP, Dreamland, copies of which she burned onto CD in the chemistry lab and handed out at her shows. Within a year she had a whole new set of songs and began performing with two fellow grad-schoolers, Andy Riley and Mo Arellanes, in a folk/punk band they named Stay At Home. The set lists of the first few shows contained, for the most part, Dafni’s old songs (including “Dreamland” and “Fall From Grace” from her EP, and new songs “Red” and “Save My Dreams”) rocked out, but they morphed into a band that played a lot of new material, co-writes, and some covers. They recorded seven of their songs onto a laptop in a teaching lab at UCLA; it never got released, but the EP is strong and the songs still sound great today. I suggested to Dafni that she make an album of her own songs, especially the ones that Stay At Home wasn’t playing anymore, because she had been performing now for several years without having an album to promote. We decided to record it at home, keeping the songs simple, without a full band, and with arrangements that differed from Stay At Home’s, just so there would be no conflicts of interest. Dafni played most of the instruments and, although the album Red has some strong, well-written songs (including the frenetic “Control,” an early fan-favorite, “Save My Dreams” and “Mr America”), it’s clearly an experiment in home recording. By the time Red came out in 2004, Dafni and I were married and Stay At Home was no more. Dafni, Andy, and Mo graduated and went their own ways, and Dafni decided to form her own band. After obtaining her PhD in 2002, Dafni worked as a postdoc at UCLA in the department of pharmacology. New songs—the best she had ever written, in both of our opinions—came quickly, such that when Red was released, Dafni already had enough material for a new album. At the suggestion of a friend at work, Dafni met pianist Craig Bender and they started playing together as a duo. After posting an ad in the classified section of the LA trade magazine Music Connection, Dafni found drummer Alejandra Cuesta, who brought bassist Yannig Luthra into the fold. Josh Bandur, brother of Dafni’s friend Maggie, joined them on guitar and accordion. This band lineup didn’t play too many shows, but they rehearsed solidly before entering Jeb Lipson’s studio, Big Scary Tree, to record Dafni’s second full album, Drifting in Circles. This record features songs that are much more sophisticated in their writing (“Dance,” “Send My Love,” and “One Day” are highlights for me), and are played and recorded well, but the album doesn’t quite gel, to my ears, and I put that down to the band’s, especially Dafni’s, studio inexperience. Nevertheless, the album was leaps ahead of anything Dafni had recorded previously. Around the time of making this record, a momentous event occurred that changed our lives: we discovered the Cinema Bar in Culver City. The band that had played on Drifting in Circles soon dissolved. Dafni enlisted upright-bassist Geoff Rakness for the CD release show, and he suggested drummer Mark San Filippo, a fellow jazz cat, join the band when Alejandra went her separate way. Pianist Craig left to concentrate on his own shows, leaving accordionist Josh as the sole holdout from the album’s sessions. Dafni played the Cinema often with this band, and soon they were joined by fellow Cinema denizens Wil Forbis on banjo and guitar and Edie Murphy on fiddle and mandolin. Many of our favorite artists from the scene (Randy Weeks, Tony Gilkyson, Mike Stinson, Jaimi Shuey, Tracey Huffman) had recorded albums with Charlie McGovern, so Dafni summoned up the courage at one Randy Weeks show to ask Charlie if he would consider recording her new Cinema-inspired Americana songs. She was amazed when he said yes, and in early 2007 her band, tight from playing together for a year or so, entered Charlie’s Big Ol’ Studio and recorded the basic tracks of 16 songs in a marathon session in a single day. The first mix of the album came on a burned CD that Charlie had jokingly labeled “Charlie’s lonely Sunday mixes,” which Dafni thought made an excellent album title: Charlie’s Lonely Sunday. She was particularly fond of this album, mostly because of the simplicity and rapidity of its recording, as well as the live band feel that Charlie had captured. It contains Dafni’s signature song, “Dimes,” a silly ditty penned while we were waiting for the bus one night on Santa Monica Boulevard. True story. The next few years involved a lot of shows with her band (often joined, when needed as subs, by Frank San Filippo on bass, John McDuffie on guitar, and Joey Stafford, Jim Doyle, and Dave Drewry on drums) around LA, as well as a few trips north to San Luis Obispo, south to Long Beach, and east to the desert to Pioneertown and Wonder Valley. Dafni got a reputation as a hardworking musician who was relentless in booking shows and playing all kinds of venues—not just the Cinema Bar but also Taix and The Echo, as well as farmers markets and private parties. Around this time, we also started hosting house concerts in our apartment in West LA. Our idea was to have great artists from the Cinema scene, the ones who normally played loud rocking sets, come to our home and play intimate acoustic shows. In the end we hosted ten wonderful house concerts over a three-year period: Dan Janisch and Tracey Huffman; Mike Stinson; Tony Gilkyson; I See Hawks in LA; Fur Dixon and Steve Werner; Jake LaBotz; Lisa Finnie; Vicki Hill; Mark Nemetz; with Tracey Huffman, once again, bookending the series. Dafni’s songwriting continued to mature and by 2010 she had a tight band and a great collection of new songs. Unfortunately, accordionist Josh moved to San Francisco and guitarist Wil experienced tendonitis that affected his ability to play. Wil suggested his friend Peter Kavanaugh as his replacement. It was an easy substitution, with Peter providing an extra level of sophistication to Dafni’s sound. After reading an interview given by Eliza Gilkyson, Tony’s sister, in which she expressed how lovely it was to have a producer when recording and thereby avoid having to make decisions in the studio, Dafni asked Dan Janisch, now a good friend in and out of the Cinema, if he would be interested in producing her next album. She was excited when he agreed, and Dafni soon found a willing engineer in Dennis Moody, who had recorded fine albums by our friends Fur and Steve and Dime Box Band. The resulting album, Sweet Time, is Dafni’s most polished and stylistically diverse album. “Under the Blue Skies,” “Part of Me,” “Someday,” “Walking Out the Door,” “Anything at All,” and “Oh, How I Wish” were all fan favorites. For the CD release show, Dafni’s band was joined by her guitar hero Tony Gilkyson, as well as her friend Debra Tala as now-regular accordionist, keyboardist, and backing vocalist. By 2013, Dafni had begun to scale back the frequency at which she performed with her band, in part to relieve Geoff and Mark of their duties as new fathers, but she did take on a new challenge when Ben Vaughn asked her to play bass in a somewhat ironic skiffle covers band, the Modern Skiffle Quartet. Dafni hadn’t played bass in a band since high school, but the chance to play with Ben, Dan Janisch, and Kevin Jarvis, three top-notch musicians she admired tremendously, was too good to turn down. For the last few years of her life, Dafni probably played more shows as the bassist for the MSQ than she did with her own music. She wasn’t writing as much, so it became a welcome respite. In 2014, Jeb Lipson, who had engineered and produced Drifting in Circles, offered to record a few songs for Dafni at his new studio. She went in with Geoff, Mark, Tony, and Debra and laid down four new original compositions (including “Many Reasons Why” and “Gloomy Day”), a cover of the Willie Nelson song “Crazy,” and a remake of “Never Make Me Cry” (originally on Red), the latter featuring Rick Shea on pedal steel. Jeb and I aim to mix these songs and release the recordings soon. For the last 10 years of her life, Dafni performed a band show annually on her birthday at the Cinema Bar. During this time, she also organized and hosted several multi-artist songwriter nights, as well as tributes to Cinema-favorites Tracy Huffman, Tony Gilkyson, Mike Stinson, and Randy Weeks in which dozens of songwriters from the Cinema scene covered their songs. When Dafni died, I decided to continue the tradition of putting on a birthday show in July. It was only two months after her death in 2016, but the community came together amazingly and Alyssa Archambault and I organized “Dafni’s 11th Annual Birthday Show” with over 50 of Dafni’s friends performing. I asked Alex Loftus, a talented artist and friend, to come up with a poster for the show. I gave her free rein and I wasn't disappointed—she based her design on a photo taken by Didier Chevalier of Dafni silhouetted by the sun, a photo taken during the making of the music video for “Sweet Time.” I didn’t request it, but about half of the acts performed a Dafni song at that show. I thought it would be a wonderful tribute to Dafni if we released a record of those particular songs. A few days after the show, Alfonso Rodenas and Victoria Scott (of The Blue Dolphins) invited me for a hike near their home in Malibu. At lunch, Alfonso offered to record and mix the album in his home studio. I said yes straight away; it seemed like a simple way for us to get the album done. In September 2016 we recorded ten of the songs, nine of them at Alfonso’s in Malibu and one, by the MSQ, at Kevin Jarvis’s studio in Venice. In March and May 2017 we recorded a dozen more songs with Dafni’s band—Peter, Geoff, and Mark—backing up the singers at Kevin’s studio. The remainder of the artists recorded their songs at their home studios. Alfonso mixed the album in June 2017 and Gavin Lurssen mastered it in July. For the cover art, I asked Alex to come up with a new version of what is, to me, an iconic image of Dafni’s silhouette. They have all done a wonderful job. Dafni wrote all of the songs on this album. A couple of them she had co-written with Sarah Stanley. Five of the songs haven’t been released on any album previously: “Are You Ready For Fun?”, a silly little skiffle piece Dafni had written for the MSQ, but never performed by them, until now; “Home To You,” a song of yearning that Dafni wrote with Sarah Stanley, who sings it here; “Popcorn,” a jazzy melody turned by Peter, Geoff, and Mark into an instrumental with nods to the Allman Brothers’ “Jessica” and the theme to “Hawaii Five-O”; and “Many Reasons Why,” a love song performed by Sam Park, and “Gloomy Day,” a song that Dafni thought was her best ever, here sung tenderly by Doug Newman—two newer songs that will be on Dafni’s upcoming EP. There are selections from all four of Dafni’s albums, with most coming from Sweet Time and Charlie’s Lonely Sunday. And the styles are diverse, both in terms of Dafni’s writing and in their interpretation. We hear songs ranging from the delicate (on acoustic guitar: Gwendolyn’s crystalline “Fly Away,” Jeremiah’s “Sweet Time,” Tony Gilkyson’s tearjerking “Part of Me,” and Mark Nemetz’ hopeful “I Don’t Mean To Disappoint You”; on piano, Debra Tala’s plaintive “So Long”), to the ethereal (Bliss Bowen’s shimmering “Floating,” Lisa Finnie’s spooky “Oh, How I Wish”, and The Good Intentions’ desert-meets-Paris “Send My Love”), to full-on rockers (Amilia K Spicer’s widescreen “Run Away”; The Blue Dolphins powerful “Dance”; Christina Ortega’s rockabilly “Walking Out the Door”; John McDuffie’s hilariously swampy “Down and Dirty”; and Dan Janisch’s dynamic “Anything At All”). There are several country songs, including Rick Shea’s plaintive “Never Make Me Cry,” Edward Romero’s heartbreaking “This One Dance,” and David Serby’s gentle “Should Have Forgotten All About You.” Dafni always had a goofy side to her personality, and the album features several of her lighthearted songs, including Grant Langston’s optimistic “One Day,” Ruthann Friedman’s take on “Dimes,” Edie Murphy’s giddy “Carried Away,” Ted Wulfers’ sweet “Honey Honey,” and Jamie Shuey’s sassy “Save Me.” Demonstrating Dafni’s diversity as a songwriter, the record also features a couple of Latin-flavored tracks (Funkyjenn’s “Lonely Sunday” and Wil Forbis’ “Let’s Pretend”), a jazzy “Complicated” by Sarah Kramer, the optimistic folk/pop of “Under the Blue Skies” by Rick McCulley, and a quirky take on a defiant “Angeleno” performed by Danny McGough. Putting together this album has been a true labor of love for me and, I think, for all those involved. These 31 songs are a wonderful testament to Dafni the songwriter and also to Dafni the woman. The title, Silhouette, came to me when Lisa Finnie was recording her version of the song “Oh, How I Wish” at Alfonso’s home in Malibu. 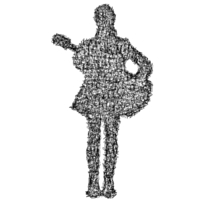 The first line of that song is, “I thought I saw your silhouette.” I hadn’t thought until then about the connection with Alex’s silhouette of Dafni that we had used for the poster to the birthday/memorial show. Or Didier’s photograph that had been blown up for Dafni’s memorial gathering and funeral. It occurred to me that this whole album was providing a musical silhouette of Dafni—much like a visual silhouette, where we don’t see the object directly but instead everything around it, here we don’t hear Dafni directly but instead feel her spirit and talent and character and love through the performances of all of the artists who contributed to paint this sonic picture. I hope you get that feeling when listening to Silhouette: Dafnis Songs Performed By Her Friends.